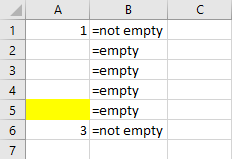 The simplest way in VBA to check whether the cell is empty is by using the IsEmpty function. In the column A you have some data. In cell A2 you have space. The following code takes the active cell and displays a message window to show you which cell is empty. As you can see space is treated as not empty and formatting is treated as empty. It’s quite likely that we want to treat space as an empty cell. This time we will write our code a little differently. We won’t use the IsEmpty function. 3. Trim(ActiveCell.Value) will remove multiple spaces from the beginning and end of the string. If there are only multiple spaces in a cell it will return “”. Now if you run the code you will get. Cell A3 has a single space. Cell A4 has multiple spaces. Cell A5 has applied formatting.